Shortly after 12 noon on Monday the 24th April 1916 Padraig Pearse stood beneath the pillars of the GPO and in the company of other members of the provisional Government, James Connolly, Joseph Plunket, Tom Clark, and Sean Mac Diarmada, read the Proclamation of The Irish Republic to the People Of Ireland. A Green Flag Bearing the inscription “Irish Republic” was raised at the corner of the GPO and Princes Street, and the Tricolour of green, white, and orange was hoisted shortly afterwards. 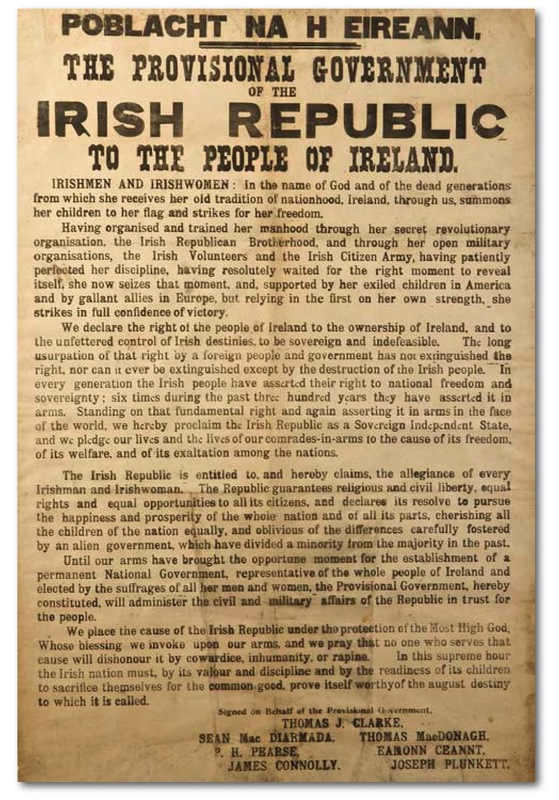 The Reading of the Proclamation signalled the start of the Easter Rising in Dublin 1916, and set in motion a chain of events that would eventually lead to Irish Independence in 1922. From my point of view the language of the Proclamation is still valid today. As an Irish immigrant in the USA I hold onto my ‘Irishness’ but can see the resemblance of the 1916 Irish Proclamation with the USA Declaration of Independence.